This tutorial provides you with a foundation for working with correcting images in Adobe Photoshop Elements. 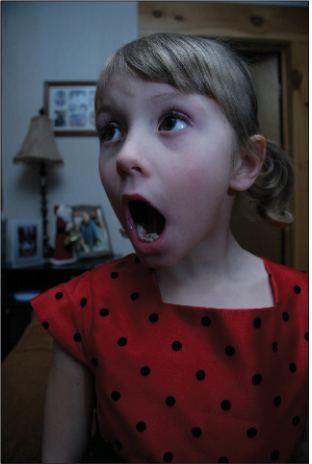 It is the fourth lesson in the Adobe Photoshop Elements 10 Digital Classroom book. 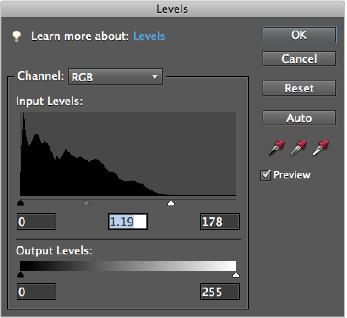 The Levels command allows you to look at a histogram showing you where most of the tones in an image are located. You can control the darkest and the lightest portions of the image and all the midtones in between. In the last two exercises, you corrected the shadows, highlights, brightness, and contrast, but you never really removed the blue color cast. Now, you’ll fix the contrast of this photo using Levels, you’ll also remove the blue color cast. The Histogram panel indicates the tonal balance of your image. It can tell you whether the image contains enough detail in the shadow (dark areas), midtone (middle tones), and highlight (light) areas. Choose Window > Histogram to display the Histogram panel. If the Histogram option is not available, that is because the Histogram panel is only available in Full Edit mode. If necessary, click the Full button just below the Edit tab, then choose Window > Histogram to open the panel. The Histogram panel shows the tonal balance of the image. 1 Click on the Organizer button ( ) to switch to the Organizer. Find the file named Lighting Levels.jpg and select it. Click on the triangle to the right of the Fix tab and choose Full Photo Edit to open the file in the Editor. 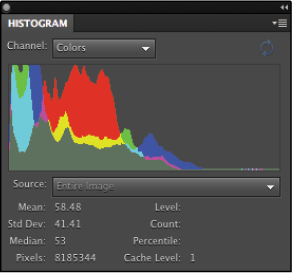 In the Histogram panel, you’ll see that the tonal information of the image is represented graphically by peaks and valleys within the Histogram panel. Shadow areas are represented on the left side of the Histogram panel and highlight areas are represented on the right side of the panel. The higher the peaks are, the more of that particular pixel value appear within the image. In this image, you’ll notice that most of the “peaks” are toward the left side of the histogram. This means that the image is lacking light tones, which would be displayed on the right side of the histogram and would give the image more contrast. You can close the histogram for now by choosing Window > Histogram to uncheck it; you’ll be seeing it again when you learn about Levels. The image before the Level changes. 2 Choose Enhance > Adjust Lighting > Levels. In the Input Levels section of the Levels dialog box, there are three sliders at the bottom of your histogram; the two end sliders control white and black, and the middle slider controls the colors in between. Drag the white slider to the left, to 178, which brings it to the bottom of the first peak displayed in the histogram. You have now made all the tones that exist from 178 to 255 white, brightening the photo. 3 To further lighten the photo, drag the middle slider to the left, to 1.19. If you were to drag the middle slider to the right, it would darken the image. 4 The image is starting to look better but you still need to correct for the blue color cast. At the top of the dialog box, use the Channel drop-down menu to choose the Blue channel. Drag the middle slider to the right to .75 to decrease the blue in the image. The final image after removing color from the Blue channel. 5 Press OK to commit the changes. Choose File > Save to save your edits. If the Save As dialog box opens, deselect the Save in Version Set with Original checkbox and press Save. If Photoshop Elements asks you to replace the file, press Yes, then press OK when the JPEG Options dialog box appears.